For over 40 years, the original USS Enterprise from the first Star Trek series had been sitting under plastic in a basement of the Smithsonian Institute. Paramount Studios donated the model in 1974 to the National Collection in Washington D.C., 5 years after Star Trek was canceled, as a novelty. 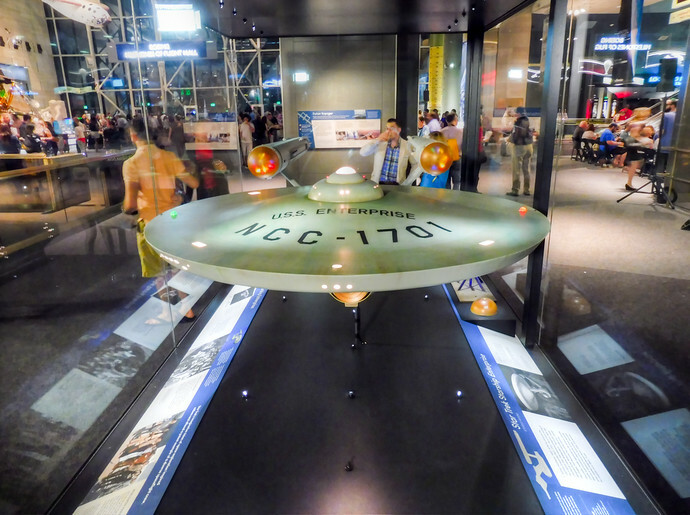 Out of the public eye it remained until 2016, when the restored Enterprise model was unveiled at the National Air and Space Museum in Washington D.C., to commemorate the 50th anniversary of Star Trek at an event I attended. The unveiling of the restored Enterprise, which is the one that was used on the show during filming, kicked off a series of evening and late night events at the Air and Space Museum. You can see all of the upcoming night events here and the Udvar Hazy Center (where there’s a real spaceship) has them occasionally as well. It’s unlikely Paramount, when they donated the Enterprise, anticipated the success of Star Wars (yes, Wars) in 1977, which spurred the creation of Star Trek: The Motion Picture two years later. Since then there have been 13 movies and with the premier of Star Trek Discovery earlier this week, 6 Trek TV series. Fortunately, but perhaps unsurprisingly, the curators of the National Air and Space Museum are Trekkies who held on to the model Enterprise even when it looked like the show had gone extinct. In case you were wondering, the starship Enterprise model is made of wood, about 1.8 meters (6 feet) long, weighing around 124 kilograms (275 pounds). The Enterprise model is currently on display at the Air and Space Museum – in my opinion one of the top 3 museums in the world – well worth a visit, Trekkie or not.